It’s a crucial year for EA Vancouver, as the studio puts a new three-year plan for the NHL series into effect. The developers have clawed their way back from a , disastrous debut on current-generation consoles but they haven’t yet been able to go much further. Will they get there with NHL 18? Eric Karlsson fends off Sidney Crosby. The key differentiator in NHL 18 is that you’ll now have full separation between your skates (left stick) and your stick (right stick), allowing you to point the stick in any direction while skating to wherever you want to go. What’s more, you’ll no longer have to glide (i.e., stop skating) to use these stick moves. For instance, you can be chasing down a rushing attacker, skating toward your net, while holding your stick behind you to take away a passing lane. Passing is another area of focus for EA Vancouver this year. Experienced players have complained for years about requesting passes from CPU teammates, only to receive the puck behind them (or not at all). Ramjagsingh told Polygon that the developers have overhauled AI passing “from the ground up,” making sure that the computer will understand where you’re going and send the pass there, rather than to where you are when you call for the puck. The CPU will even try banking passes off the boards now. “It has really changed the flow of the play,” said Ramjagsingh. 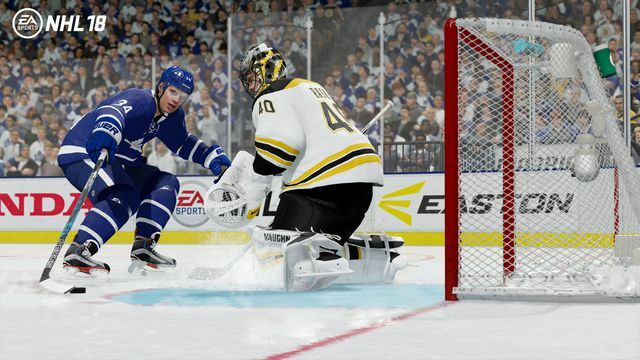 EA Vancouver worked on other elements of the game’s AI, too — work that was necessary for the main new mode in NHL 18: NHL Threes. The NHL has been using three-on-three overtime in non-playoff games for two seasons now, and it’s proved to be a hit with fans. With only six skaters on the ice, the rink is wide open for odd-man rushes and high-skill playmaking. 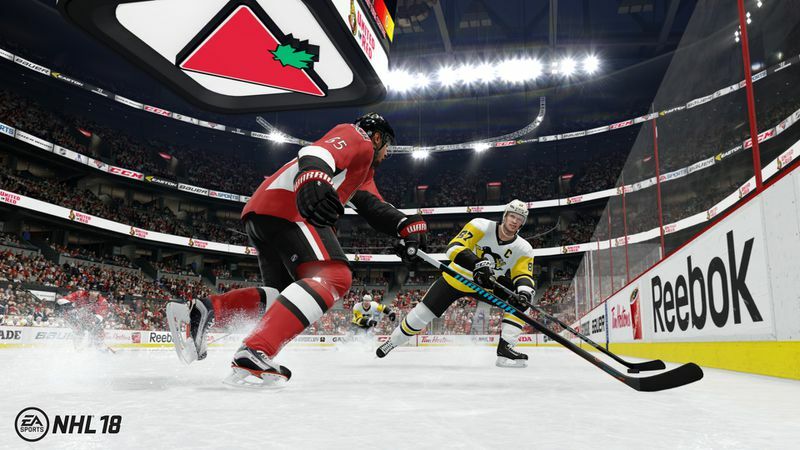 EA is bringing three-on-three overtime to EA Sports Hockey League, the series’ online league mode, and also spinning it out into its own mode. NHL Threes offers arcade-style hockey with three-on-three play. It’s meant to deliver fast-paced continuous action — the only faceoffs come at the start of each period, there’s no icing or offsides, and all penalties result in penalty shots — that’s still grounded in reality. “I would say it’s more arcade-inspired,” Ramjagsingh explained, noting that you’ll see bigger hits but no power-ups or big heads. Which is to say, it’s not really a modern analog to 3 on 3 NHL Arcade, the over-the-top hockey game that EA released in 2009 on PlayStation Network and Xbox Live Arcade. NHL Threes has its own smaller rinks. The rink is smaller to match the lower player count — about 75 percent the size of a regulation NHL rink. The scoring isn’t typical, either. One optional feature, Money Pucks, can make a goal worth as many as three scores. You can choose to play “first to X goals,” or just keep the standard setup. If all of this sounds like a frivolous throwaway mode, there’s at least one promising element to NHL Threes: a campaign. You’ll be able to take teams through multiple circuits with boss games at the end of each one. And as you defeat other clubs, you’ll earn rewards that you can take with you, like logos, uniforms, mascots and even players. Of course, the mode is also designed to bring in novice players, people who might be intimidated by the simulation hockey in NHL 18. Those who aren’t can jump into the deep end with the updates to Franchise mode. “The reception was extremely, extremely positive,” said Ramjagsingh, when we asked about the fan feedback regarding NHL 17’s overhaul of the Be a GM mode into Franchise. 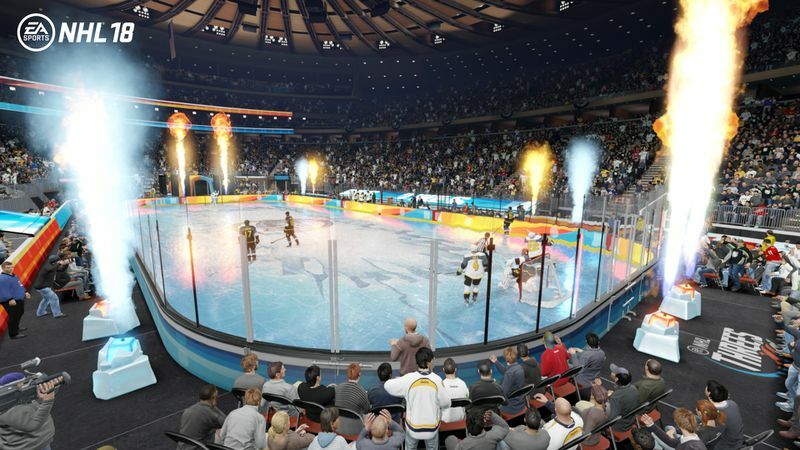 With the impending debut of the Vegas Golden Knights — the first time the league has grown since the 2000-01 season — EA Vancouver saw an opportunity to expand Franchise mode once again. The Golden Knights will be the 31st NHL franchise, and NHL 18 buyers will be able to play as them — with their gray and white jerseys, in the brand-new T-Mobile Arena — about three weeks before the club begins play in real life. Ramjagsingh explained that “going to 31 teams, from a tech perspective, was not a small feat for us,” so the developers wanted to do more. Bringing the Golden Knights into NHL 18 provides for three new ways to play Franchise mode. You’ll be able to take control of Vegas and build your roster through the expansion draft, just like the real-life team is doing this week. If you choose to play as an existing team, you can submit a list of unprotected players for the expansion draft, one of whom will end up on the Golden Knights. And you can even expand the league yourself by creating a 32nd team and customizing its logos, uniforms and arena. EA Vancouver also wanted to expand the series’ multiplayer options for NHL 18. Online team play will now support all kinds of combinations of local and online players. Pairs of people playing on consoles at three different houses want to form a six-person squad? Totally doable! The NHL series has taken some licks recently, and EA Vancouver has worked hard to get back in fans’ good graces over the past three years. Ramjagsingh acknowledged that it’s hard to think about innovation when you’re just trying to catch up to where you were before. That road ahead will entail a transition to EA DICE’s Frostbite engine, but not yet. FIFA went to Frostbite last year and Madden is making the change this year; for now, Ramjagsingh said the NHL developers are gathering “lots of learnings” from those teams. That might sound disappointing, but if there isn’t a specific desire from the series’ fans, it wouldn’t make sense for EA Vancouver to develop a story mode. Plus, the NHL team likely doesn’t have the same resources as the groups behind FIFA and Madden; it’s not an apples-to-apples comparison. In that light, EA Vancouver should carve out its own path, and it sounds like that’s just what it’s doing with NHL 18.